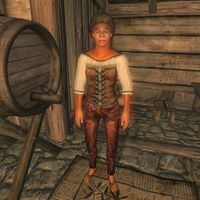 Minerva is a Redguard pilgrim and a permanent resident at the Inn of Ill Omen on the Green Road between the Imperial City and Bravil. With nowhere else to go, and no one to talk to but innkeeper Manheim Maulhand, Minerva lives a cheerless and rather drunken life at the Inn. Her room is located in the upstairs area, second door on the left, and she gets out of her bedroll every morning at 6am. She stays in her room until noon, and then heads downstairs for six hours of drinking and chatting with Manheim. At 6pm, she returns upstairs and sits down for a two-hour dinner before she goes to sleep at 8pm. She wears a quilted doublet, a pair of laced leather pants and huntsman moccasins. She carries around a few apples, her trustful mug and a small amount of gold. When you meet her for the first time, it will shine through that her everyday life at the inn is rather empty: "Hello stranger. We don't get many visitors around here. Makes things pretty lonely for me, if you know what I mean." or "It's good to see you, friend. This inn has been cheerless for far too long." but if your disposition is below 30 with her, she will angrily say, "You make me sick! Now get out of here before I have Manheim throw you out!". If you ask her about the inn, she will explain why she sticks around: "The only people that stay here are stragglers on the Green Road. Me, I got no place else to be. Besides, I think Manheim is sweet on me." When you close the conversation, she will say goodbye in a rather flirtatious manner: "Bye now, sweetie. I look forward to seeing you again." When you re-enter dialogue with her, she says, "Still here, stranger? You're not actually renting a room, are you?" If asked about Rufio while on the Dark Brotherhood initiation test, she will provide a little information on him: "Not a lot to tell. He doesn't much like company, and spends most of his time in his room. Manheim thinks he's hiding out from someone." After the quest however, she will state that Manhiem's thoughts were true: "Rufio is dead. He was murdered. It looks like he was hiding out from somebody after all." Esta página foi modificada pela última vez à(s) 18h45min de 15 de julho de 2014.